Odds are that you have an Outlook RSS Reader sitting unused on your desktop. RSS is an older web technology. It stands for Really Simple Syndication, and it’s been around for nearly 20 years. Odds are that you have seen that little orange RSS logo without knowing much about it. Simply put, RSS provides a public feed of articles or posts published on web sites. For years, people have used RSS feeds to receive information automatically from their favorite web sites and news services. Consequently, I use RSS to publish all of my articles, too. Anyone can connect to this feed easily. At the same time, I use RSS to capture articles from other web sites of interest. There are also content aggregation services such as Feedly which compile collections of articles and share them. The popularity of RSS has dropped in recent years. Many people just share their content using social media such as Facebook, Twitter and others. This web site uses both methods. 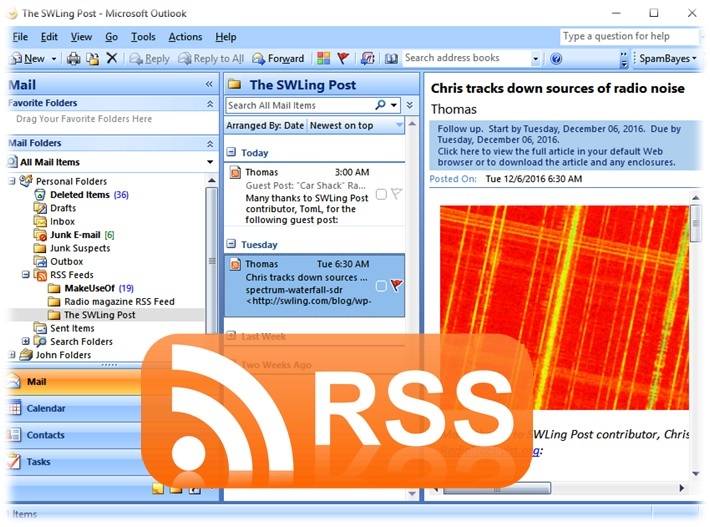 So what is an Outlook RSS Reader? For years, I have used Outlook as my personal information manager – email, contacts, scheduling. In fact, I still use Outlook 2007. It may be ten years old now, but works great. Recently, I noticed that you can use Outlook as an RSS Reader. Hard to believe, but I did not notice this before, even though I use Outlook every day. There are various articles and videos on the web describing how to hook up an feed in an Outlook RSS Reader. To subscribe to all of my articles, just use “http://play.fallows.ca/wp/feed/” in Outlook or any other RSS reader. It is really simple. Once you have an feed set up in Outlook RSS Reader, you can adjust its Properties to archive or delete content after a certain period of time. Some feeds contain the whole content from an article. Others just provide a summary and a link to click for the compete article. Lastly, there are many other RSS apps for your phone, tablet or computer. Use one.